After a day's rest to recover my hearing from the explosive Art Brut show at the Bluebird, I ventured into the beautiful, small venue to see Dirty Projectors. The Brooklyn band's artsy, experimental rock proved a stark contrast from the raucous, drone heavy, punk-laden experience of Friday night, but it marked a second straight amazing show from start to finish. Seeing Dave Longstreth and the band live, bringing all of the ornate and complex instrumentation of this year's excellent album Bitte Orca to life was truly amazing. The band was tight, the vocals mixed perfectly, and performed perfectly. It's a massive treat to have bands of this caliber land in our cultural oasis between the coasts. Opening for Dirty Projectors was Merrill Garbus' solo-band tUnE-yArDs. It's a lo-fi musical treat that in its nature creates one of the best live experiences you can find outside of straight, growling power rock. Garbus, alone, began most songs with a string of looped vocals, blasts on the rim or skin of her tom and snare, and plucked bits on her ukulele. It takes a unique confidence to create, on the go, every track for a single song. And then to play a complete 45 minute set doing just that is remarkable. Garbus brings art rock and power-chord heavy melody to the ukulele. She effectively resists the inherent cuteness of the instrument by making it into a pedal-driven mini-monster. This combined with a meek, but haughty vocal style makes tUnE-yArDs special and very deserving of a larger following. Her writing too, both musically and lyrically carries a strong self-awareness and at times felt as though seeing her live was an invitation to a carnival ride than a passive listening experience. Her album, BiRd-BrAiNs, came out earlier this year and completely recommends her performing ability, but doesn't completely capture it. The album is a set of excellent tracks, but even more it is well designed and packaged to feel somewhere between a disc in an old record sleeve and something you might luck upon by talking to the performer outside a show by her an old station wagon with the lift gate up. Check the band out. And the band we all came to see, and by we all I refer to a near capacity Bluebird theater that was as full as I've seen it this year. To fill a small venue, as a rising, but not massively-followed band, on a Sunday night, in a city that does inevitably "sleep" by 1 or 2am deserves praise. Dirty Projectors brought their best, with excellent versions of "Cannibal Resource," "Useful Chamber" and other great pieces of Bitte Orca. The true high-point was "Two Doves" being so beautifully, tightly and soulfully sung by Angel Deradoorian. Excellent vocals and harmony from Amber Coffman, and the rhythm section of Brian Mcomber and Nat Baldwin were near-album perfect. 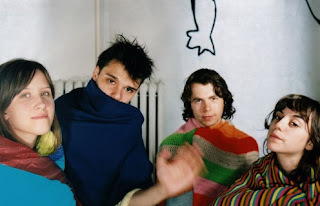 When a band as experimental and complex as Dirty Projectors translates from album, where the safety of the studio and production and track layering abound, to a live performance it's an indicator of greatness. Bitte Orca is a top album of the year candidate in my mind, and the band did nothing but elevate my opinion and that of a packed house. This was a dedicated fans show, where people grooved and danced and clearly hold a special place for this undefinable music style in their hearts. The Bluebird struck gold twice, and now, the only regret is that the two shows are over.